This is the "Our Father" written in Aramaic — the language Jesus spoke in his every day life. We think we know him and how he lived, but take a look at this prayer and see if you can make any sense out of it. Surprise! He didn't speak English! And he was not called "Jesus" — he was called Yeshua. I LOVE to learn all I can about Our Lord and the culture and times in which he lived. The Holy Land is like a 5th Gospel — it helps us understand and know more deeply. 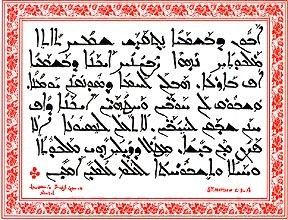 There are still Syrian Christians who speak Aramaic and their Mass or Liturgy is still celebrated in Our Lord's language. On our pilgrimages we have a man recite the Lord's Prayer — the Our Father — so that everyone can hear how it sounds. Fascinating stuff! On Friday, I will be be on two radio shows and then speak in Petoskey Michigan on Saturday evening. For more info, view my Events Calendar.